We docked at Tallinn on a beautiful day. 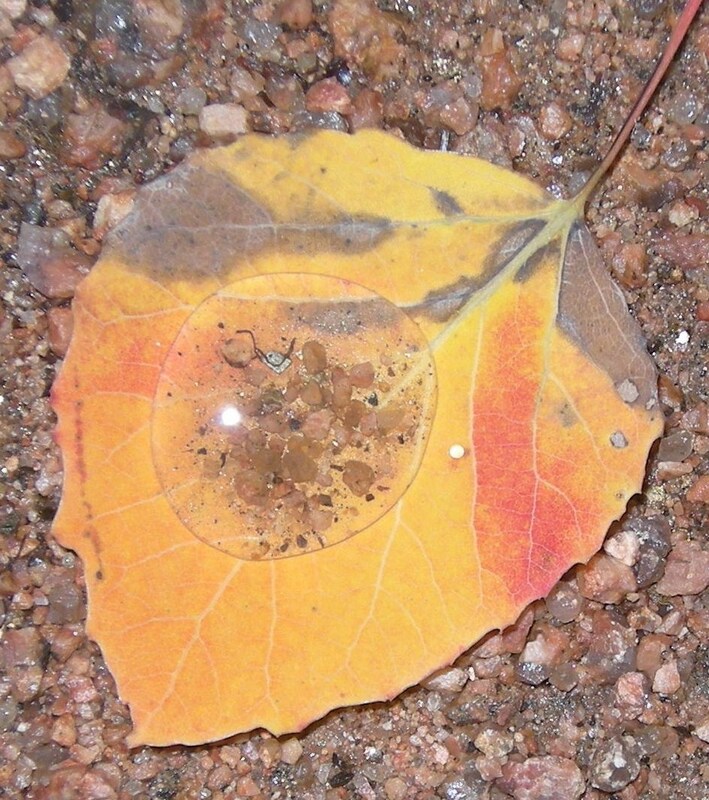 At 7:45 a.m., the temperature was 25°C/77°F! My husband got sick on the ship yesterday, and was quarantined for 24 hours – obviously no one wants a virus to spread like wildfire through the cruise ship! So I was on my own on the shore excursion to Tallinn, Estonia today, and sat by myself on the bus, wearing a bright green sticker with the number 8. The guide was a very handsome young man named Uve, (he looks a lot like a young Matthew Crawley on Downton Abbey!) who was funny, spoke very good English, and told us a lot of stories about his country. Estonian belongs to a small language group called the Uralic languages (named for the Ural Mountains, where the ancestor of these languages is thought to have originated). There are four main languages in this group, Uve said: Estonian, Finnish, Hungarian, and Elvish. Several people giggled at this, assuming it was a joke – which it was, but only partly. J.R.R. Tolkien liked the melodic sound of Finnish and when he created the language for the hobbits in the Lord of the Rings series, Uve told us, he incorporated the inflection of the Uralic languages and some of their words into the fictional language of the hobbits. (For more information, see https://en.wikipedia.org/wiki/Languages_constructed_by_J._R._R._Tolkien). The nearest relative to the Estonian language is Finnish, which shares many similar words. Estonian is a difficult language, because unlike most European languages, there are no prepositions. Suffixes are added to words to describe a relationship in the way prepositions do for us. Also, Estonian has 14 cases! And there is no future tense – (Uve joked about that too, telling us that there is a saying that the reason the language has no future tense is because Estonia has no future) – so listeners use the context to figure out when the speaker is talking about the future. Furthermore, there are no genders: “dema” means man or woman. In spite of the country’s geography and history, Estonian is very unlike Slavic and Germanic languages spoken in surrounding countries, although they have borrowed many words from these languages. The second major language spoken here is Russian, due to Estonia’s position as one of the former Soviet Republics and Russian influence during the time of the czars. All schoolchildren in the Soviet era had to learn Russian as their second language. However, since the break-up of the USSR in which the Soviet Republics all regained their independence, English has risen in importance and is now the most spoken foreign language in Estonia. Signs in Tallinn were often written in three languages – Estonian, Russian and English. 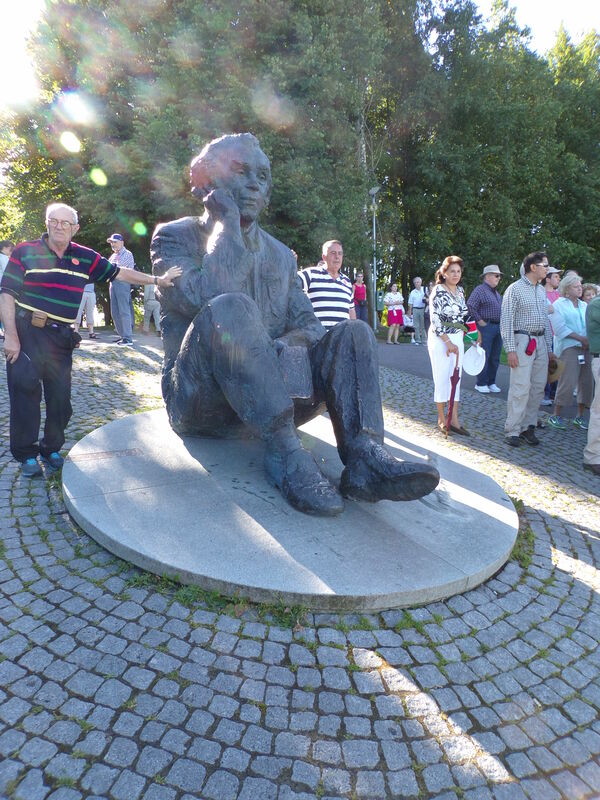 I found that everyone I spoke to in Tallinn understood and spoke at least some English. 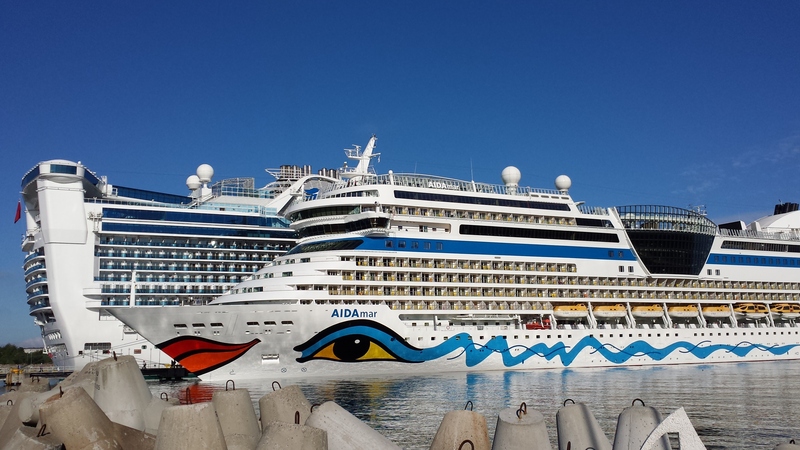 Estonia gets about 300 cruise ship visits per summer and the tourist industry has grown tremendously. 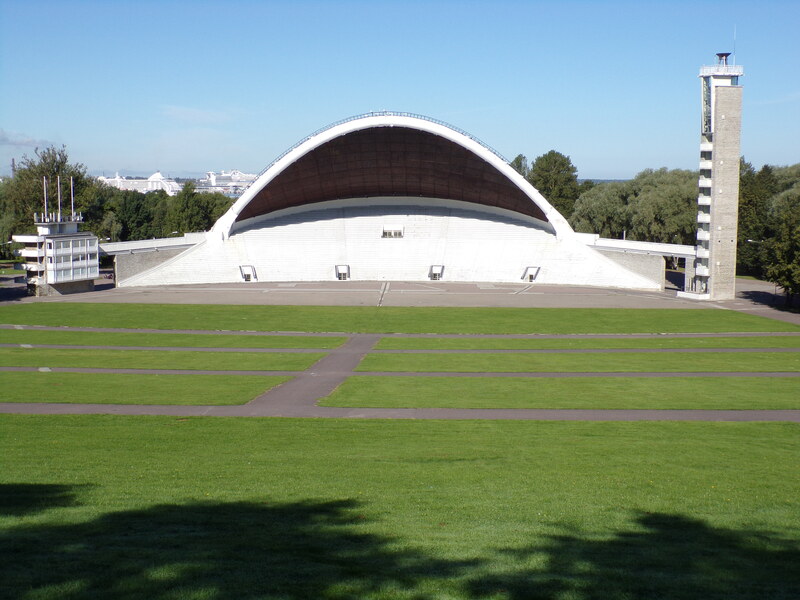 There is also extensive ferry service between Tallinn and Helsinki. The two have a close relationship and a friendly rivalry. 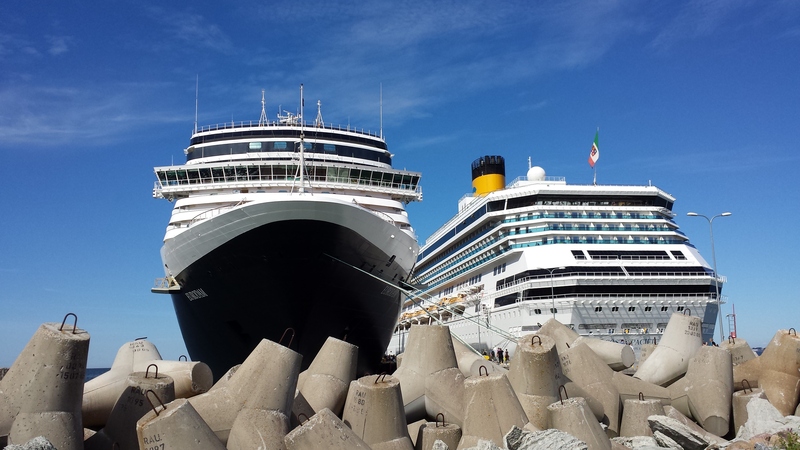 The ferries use their own harbor, as do the cruise ships, while cargo ships use another harbor. Currently there are 6 cruise ships docked here in Tallinn, some smaller and some larger than ours. 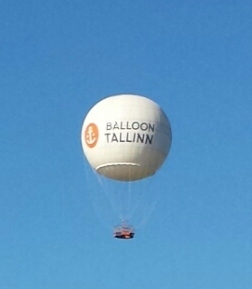 Calculating an average of 2,000 passengers per ship, that means there are close to 12,000 tourists in Tallinn today, in addition to tourists NOT on cruise ships, not to mention the actual residents of Tallinn! This made sightseeing and keeping track of our tour somewhat difficult – more on that later! Anyway, trying to take pictures without a bunch of tourists blocking the view was a challenge! Coastal Estonia is better suited for cargo ships than Russia. The soil in that part of Russia is very soft and sloped, not conducive to building ports. This may be one reason why Tallinn is much older than St. Petersburg, which was founded in the 1700s. Catherine’s Palace (Kadriorg, which in Estonian means “Catherine’s Valley” even though it really isn’t), is in a suburb of Tallinn. 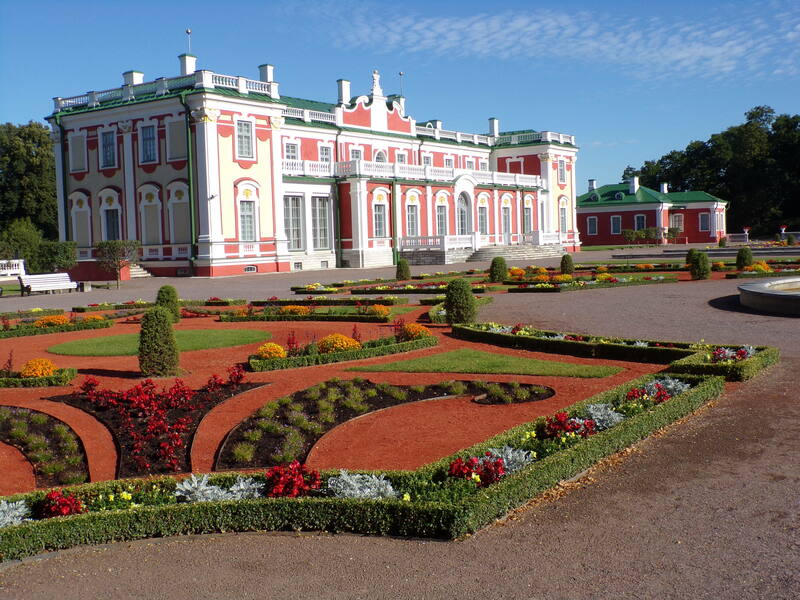 The palace was commissioned by Peter the Great and construction began in 1718, as a gift to his second wife, Catherine I. The location was selected because Peter recognized the need for access to ports and therefore had to establish a Russian presence in the area. The palace, built in symmetrical Baroque style, including the gardens in front, was the summer palace of the czars until the overthrow of the monarchy. 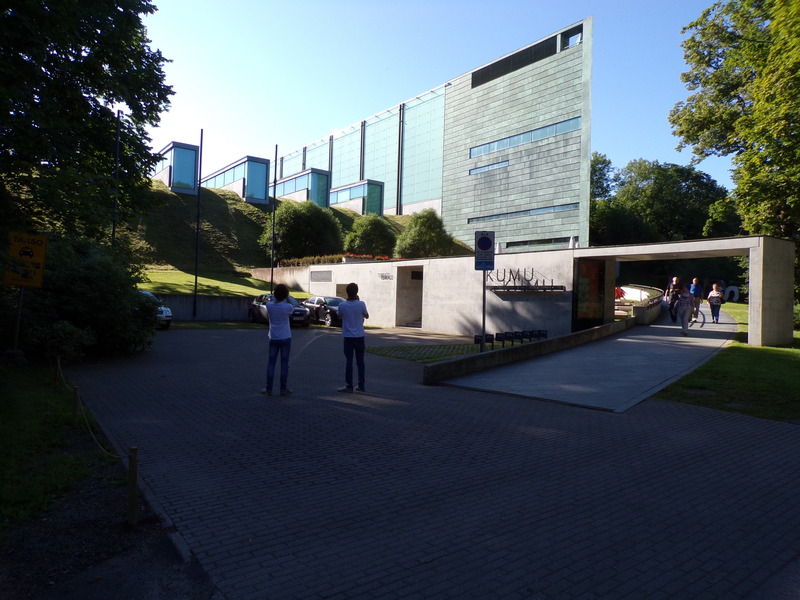 It’s quite a beautiful place, although we did not tour the inside, which is now an art museum. 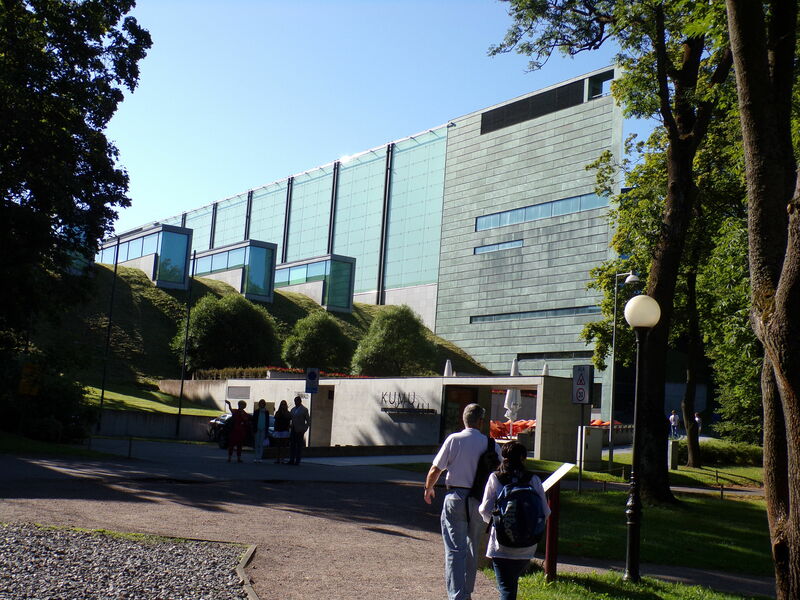 In the same vicinity are the president’s residence and an art museum built in an ultra modern architectural style with beautiful rose gardens on the sloped ground in front of it. 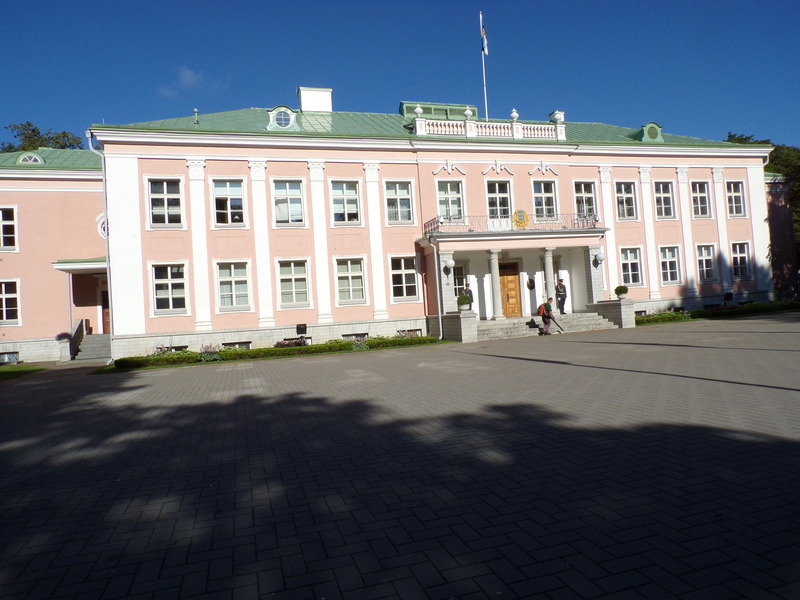 I was surprised to find the president’s house so lacking in security – there is no fence or wall in front, and I saw only two guards at the main entrance – until Uve told us that it is the prime minister that has the most power; the president’s job is much less important – he only has veto power for legislation. 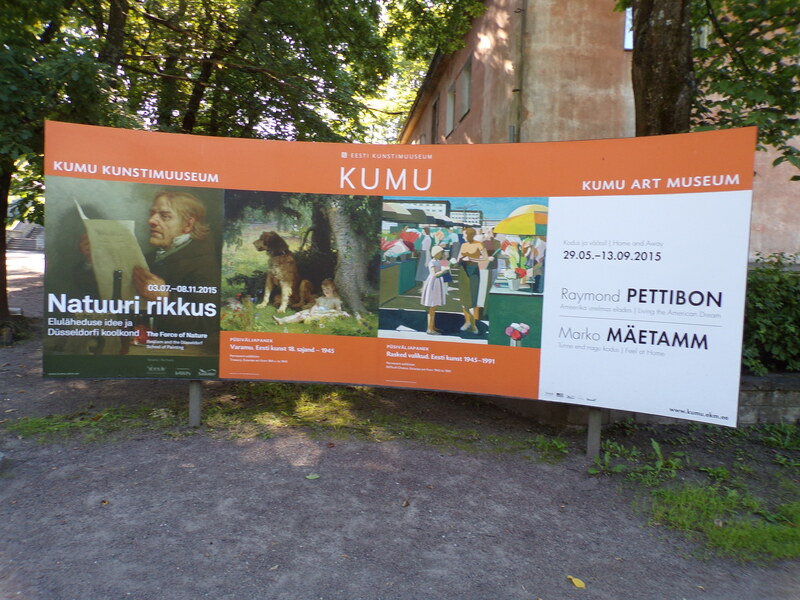 KUMU or Kunstimuuseum is the art museum housed in a architecturally modern building. 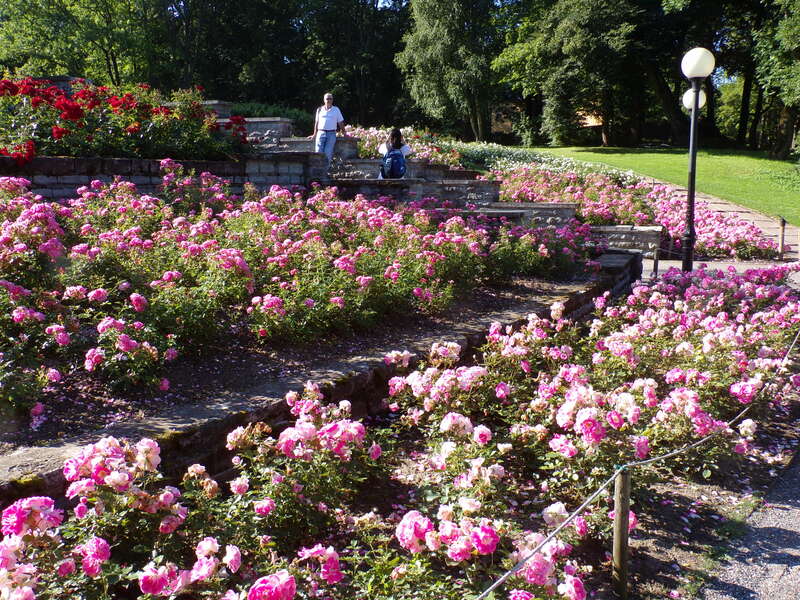 The circular rose garden flanks the steps leading up the hill to the museum. Our next stop was at the song festival grounds. 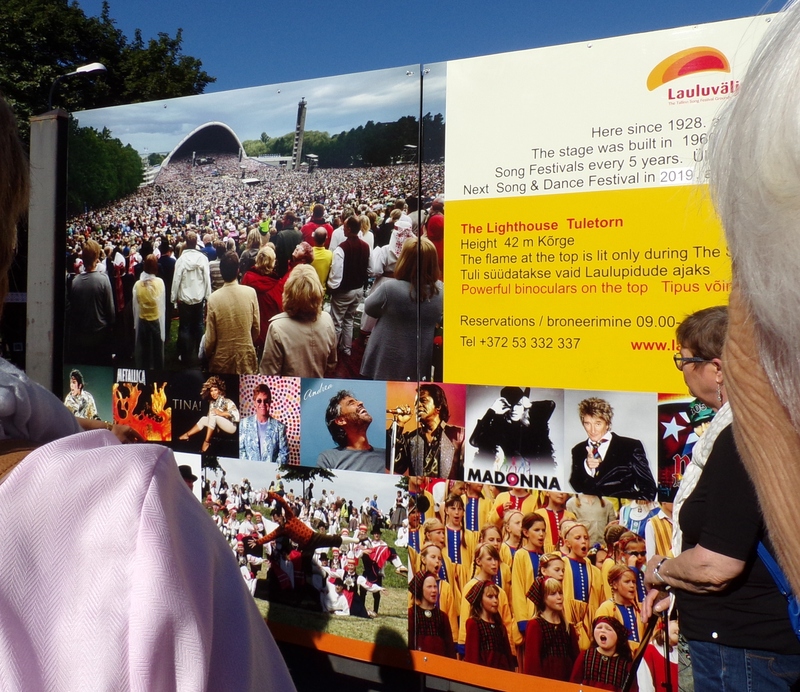 The song festival, Laulupidu in Estonian, was established in 1869 and has been held every 5 years since then. Choirs come from all over the country and now even a few international ones participate. In the 1960s, a new stage was built, and spreading out in front is a huge lawn lined with intersecting walkways. The festival grounds can accommodate more than 100,000 people and the entire space was packed at last year’s festival. The next festival will be held in the summer of 2019.
https://www.youtube.com/watch?v=3QdlJtEWIRA. This is a video of about 7 minutes. More videos of the festival will pop up on You Tube when you download this one. I include all this in here because looking at these articles moved me so much as I began to listen to the music and understand the importance this festival has for the Estonian people. The main religions of Estonia are Russian Orthodox and Lutheran. Many people became Lutheran after the Protestant Reformation and Lutherans make up the largest denomination now. 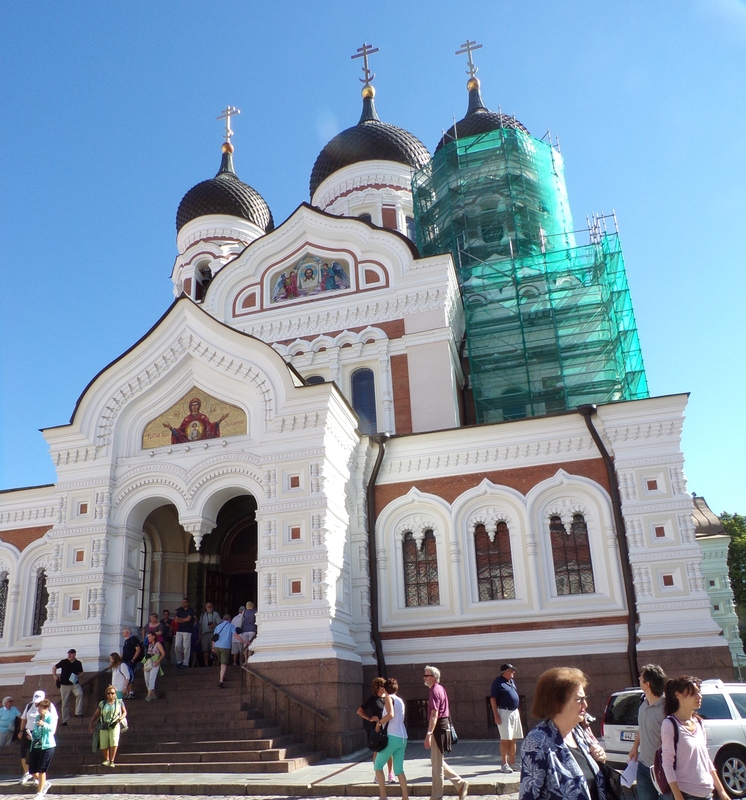 There is a beautiful Russian Orthodox cathedral in the old town, Alexander Nevsky, built in 1900, which must be the most photographed structure in Tallinn! The crosses on top of the cathedral have 2 cross bars, which is the Orthodox symbol of the cross. 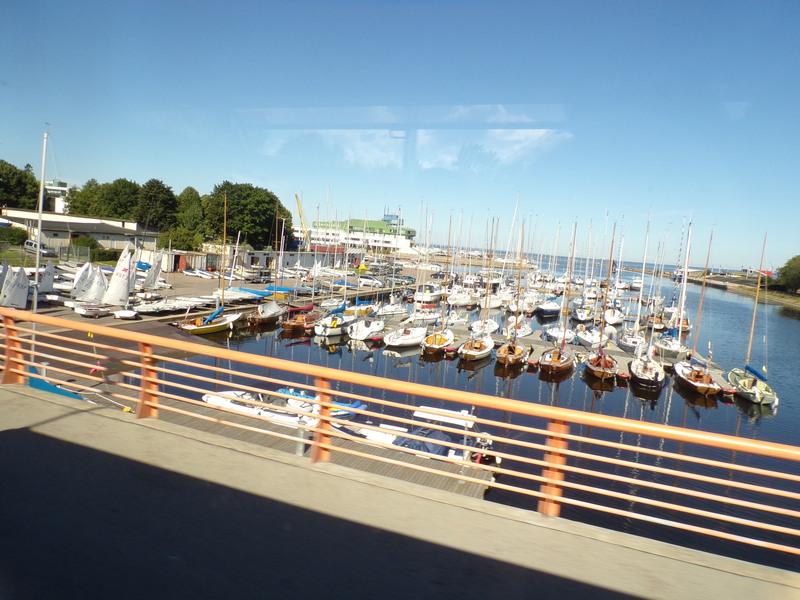 We then visited a nice marina, which was where sailing events in the 1980 Olympics were held. Uve gave two reasons for this: Estonia’s coastline was more suitable than Russia’s and also the Soviet government wanted to impress upon Estonia, and the world, their control of the region and the “close ties” between the two countries. Nowadays the small Olympic village houses a hotel and sports offices.